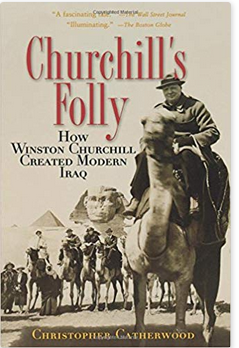 Churchill’s Folly as the title suggests covers Winston Churchill’s decisions after World War I that led to the creation of Iraq. England had conquered Mesopotamia during the war, but came out of the conflict overextended and in debt. Churchill’s response was to try to cut costs, first by reducing the military forces in Iraq and then creating an Arab government to run things under Feisal son of Hussein bin Ali, the Sharif of Mecca. Author Christopher Catherwood wanted to focus not only on Churchill’s thinking, but the larger forces at work that led to the birth of Iraq. Catherwood starts with the rise of the Ottomans, their fall during World War I, and the Arab revolt the British funded. He tries to dispel some of the myths of the period. For example, he notes that most of T.E. Lawrence’s The Seven Pillars of Wisdom was made up. He writes that Feisal was a leader in the revolt against the Ottomans, but gained few followers, and his forces did poorly in the war, only succeeding in raids. Catherwood also deals with some of the debates over the Arabs. Elie Kedourie in The Chatham House Version and Other Middle-Eastern Studies argued that Arab nationalist did not exist at time. Rather Feisal and others were only following their clans and tribes. John Keay in Sowing the Winds on the other hand believed the opposite. Catherwood comes down between the two writing that while Sharif Hussein and his son were attempting to enrich their clan there were also Arab nationalist sentiments. Finally, there’s the issue of European imperialism as the French and British carved up the Ottoman empire. The Sykes-Picot Treaty is the most infamous example of that The British made the agreement to create a French buffer zone between London’s new holdings in Mesopotamia and the Russians. After the Bolshevik Revolution however, there was no need for the deal, and it was discarded for new ones. Churchill was actually against London expanding after the war due to the costs. He wasn’t even interested in Mesopotamia, but Prime Minister Lloyd George and others in the government were. Catherwood does a good job not only going through this background material, but some of the ideas surrounding it. The heart of Churchill’s Folly is the chapters on Iraq. First, Churchill’s main concern was cutting troops and costs in Iraq. After World War I, Churchill was War Minister. He noted that England had forces in Turkey, Egypt, Palestine, Persia, Russia, Ireland, India and Mesopotamia. That was too much, especially because London came out of the war in debt. As early as August 1919 Churchill said that the number of soldiers in Mesopotamia should be cut in half. Eventually, Churchill got the Royal Air Force (RAF) to take over security, lessoning the need for ground troops. Second, there was an argument within the British government over what type of rule it should enforce in Iraq, direct or indirect. The India Office favored the former, and held sway initially until southern and central Iraqi tribes rose up in the 1920 Revolt convincing officials in London to go in the other direction. That led Churchill to organize the 1921 Cairo Conference that included notables such as T.E. Lawrence, Gertrude Bell and Percy Cox to discuss what kind of government Iraq would have. Most already believed one of Sharif Hussein’s sons, either Feisal or Abdullah should be made king. Churchill finally agreed that Feisal would get Iraq, his brother Abdullah Transjordan and since they were not locals to either they would be beholden to London. Their father the Sharif of Mecca who was already on the British payroll would be in a similar position for having his sons rise to power. This was Churchill’s vision of London’s hegemony over the center of the Middle East. This was accepted by the George government, but then Feisal wouldn’t be the puppet England hoped he would be. He wanted Iraq to have full independence, thus asserting his own sovereignty in the process. This greatly angered Churchill, but eventually an Anglo-Iraq Treaty was signed that promised Iraqi self-rule in the future, while maintaining British influence. Catherwood highlights the colonial and racist world view of Churchill throughout these sections. He was a true believer in the British empire, looked down on Arabs, and didn’t care at all what they wanted. Feisal was simply a means to an end, namely to cut the amount of money London was spending in Iraq. At the same time, he wanted Baghdad to continue to be dependent. When Feisal started making demands, Churchill went into a fury remonstrating and threatening him if he didn’t fall into line. The end of the book isn’t the strongest as it tries to cover the history of Iraq after Feisal all the way to the 2003 U.S. invasion. Catherwood believes that Feisal was a weak monarch, and Iraq suffered from political instability after its creation. He comes to this conclusion by comparing Feisal to his brother Abdullah in Jordan. They both had to deal with British machinations, yet Jordan remained stable for decades and Abdullah’s family still rules there compared to Iraq where Feisal’s successors were killed in a coup, leading to years of military rule and dictatorship. Finally, he doesn’t believe the widespread western view that Iraq is an artificial state. He notes that many countries in Europe after World War I were made up as well such as Yugoslavia and Czechoslovakia. Neither exists today, but Iraq still does. While it’s not the worst ending, it was obvious that the last two chapters were late additions as Catherwood was thinking about the Iraq War and its aftermath. Churchill’s Folly is a very good addition to the literature on the creation of Iraq. It’s obviously focused upon the British role, but also notes Feisal’s agency towards the end. Catherwood has an engaging style and is not too formal. His review of opposing ideas on topics and then giving his own opinion for instance, is done in a much better way than academic books. Most of the book is based upon Churchill’s papers, and there are plenty of quotes from him, so the reader gets a real sense of what he was thinking. Although an imperialist, Churchill was not that interested in Iraq, and would have probably left if it was up to him, but because Premier George wanted the new territory, Churchill made do, saving the government money, and creating the Iraqi monarchy to run the country so England didn’t have to. The problem was this creation proved deeply flawed, which Catherwood puts on Feisal as much as the British. Why Did Trump Ask Iraq For Its Oil?